A universe tries to begin and implodes instead. "His Greatest Battle Begins", says the tagline for The Amazing Spider-Man 2, a movie so poorly received, so poorly thought out, and so overly expensive that this iteration of Spider-Man's greatest battle both began and ended right here. 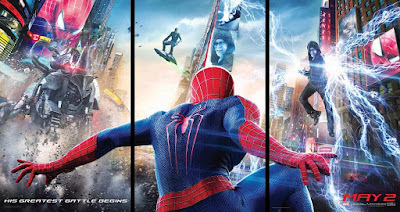 2012's The Amazing Spider-Man had been, in my opinion, largely a waste of time, since it re-told an origin that had already been told perfectly in 2002's Spider-Man - and since the previous version had been perfect, the 2012 telling could only come off as a lesser film from the moment it started. Director Marc Webb's greatest battle was to make another version of Spider-Man's origin worth sitting through, and he wasn't quite successful. 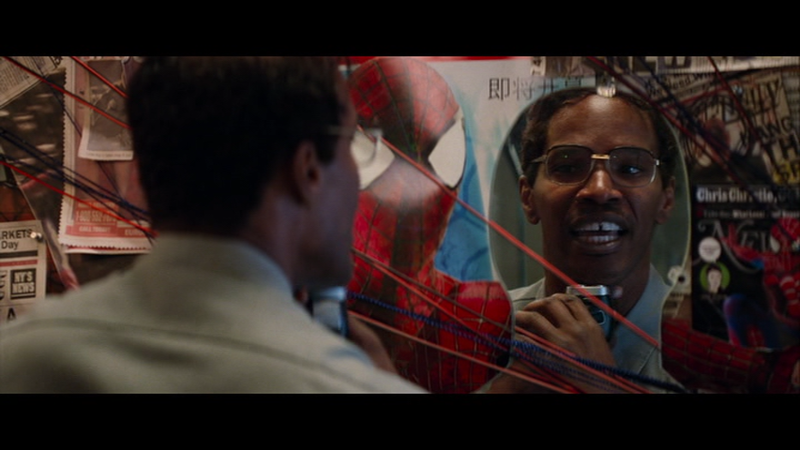 Beyond the origin, though, there was some good stuff in The Amazing Spider-Man involving the villainous Lizard and the story of the relationship that develops between the kid beneath the Spider-Man mask, Peter Parker (Andrew Garfield), and his high school classmate Gwen Stacy (Emma Stone). Garfield and Stone had incredible chemistry with each other; it was no surprise that they began dating off screen as well. 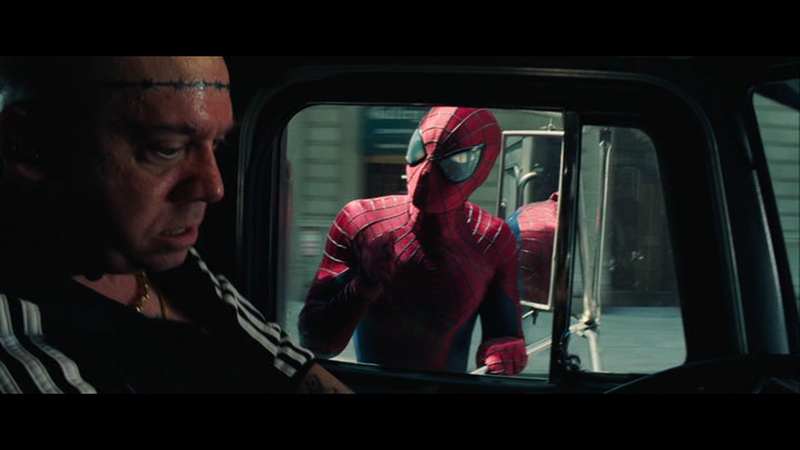 Webb returned to the helm for this sequel, working from a script that originated with writer James Vanderbilt, who had also written the initial drafts of the previous film. 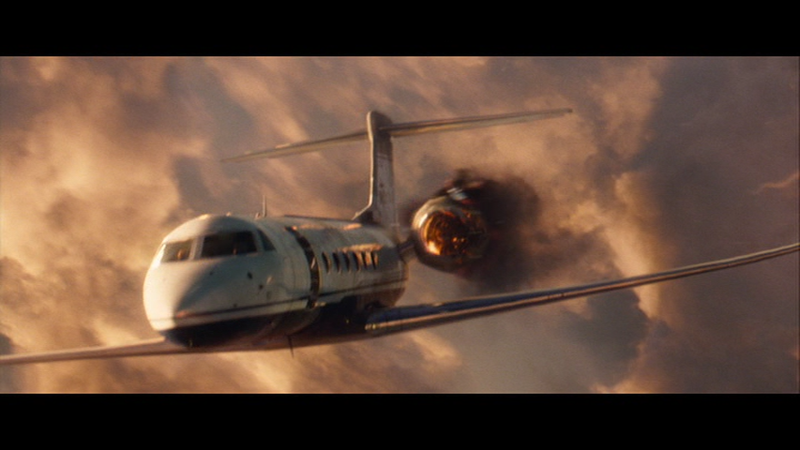 But like Vanderbilt was rewritten by Steve Kloves and Alvin Sargent on Amazing 1, on Amazing 2 he was rewritten by Alex Kurtzman, Roberto Orci, and Jeff Pinkner... and somewhere along the line this became an over-reaching, cobbled together mess. Webb's feature directorial debut was the relationship comedy/drama (500) Days of Summer. 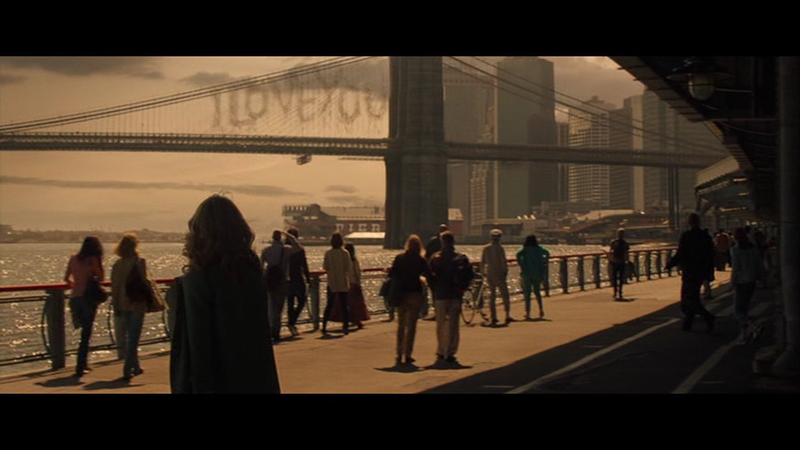 The Amazing Spider-Man was only his second movie, and the relationship aspect was the strongest part of it. With this sequel, Webb continues to show that relationship drama is truly what he is best at, as the one thing that really works about this movie is the continuing love story of Peter Parker and Gwen Stacy. It is goofy that they're actually having Peter see visions of Gwen's late father (Denis Leary), who had figured out that he was Spider-Man in the previous movie before getting killed fighting the Lizard and, with his dying breath, made Peter promise to stay away from his daughter, but it makes sense that the fact that he has been breaking the promise is weighing heavily on his mind. Peter's guilty conscience causes the couple to break-up early in the film, but there's a reunion and a reconciliation as the story goes on, and all of that stuff works quite well because of the chemistry between Garfield and Stone. They're fun to watch and make Peter and Gwen characters you root for. In addition to the Peter/Gwen love story, The Amazing Spider-Man 2 also has a very comic-accurate presentation of Spider-Man himself going for it. By popular demand, the lackluster suit of The Amazing Spider-Man was re-designed into a suit that looks like it came right off the pages of a Spider-Man comic book. This is the best the Spider-Man suit has ever looked on screen, and when this perfect-looking Spidey steps into danger to fight some crime he acts just like he does in the source material: constantly bouncing around with hyper energy and babbling non-stop. The Spider-Man of the comics fills panel after panel with wisecracks, and this Spider-Man rambles on just the same. We have a good love story between Peter and Gwen and a perfect Spider-Man, so how does this turn out to be the worst film of the franchise? It's because almost everything around those elements is jaw-droppingly awful. 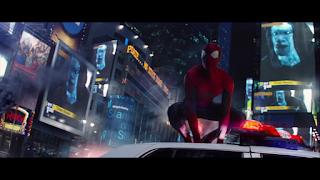 The story begins at the same point that the previous movie began, with Peter's parents Richard and Mary (Campbell Scott and Embeth Davidtz) leaving their young son in the care of his aunt and uncle and going on the run, their work as scientists at the company Oscorp having gotten them into some kind of trouble. While it ignores one of the threads the first Amazing left dangling - Peter's quest to track down the man who murdered his uncle - it does solve the mystery of what was going on with Peter's parents, and the answer is one of the film's many missteps. Oscorp's owner Norman Osborn (Chris Cooper) has long been dying of the disease retroviral hyperplasia and has had his employees doing various types of genetic research in the hope that a cure to his disease might be discovered. Richard's research involved spiders, because spiders can self heal. Maybe people could be given that same ability... The problem was, Norman intended to profit off of this research not only by curing diseases but also by selling it off to military organizations so Richard's research could also be used to create biological weapons. What Norman didn't know was that Richard was using his own blood in the genetic experiments, so only someone of the Parker bloodline could benefit from the results. Only a Parker would be compatible. Thus, Peter Parker is the only person in the world who could have become Spider-Man from being bitten by that genetically modified spider in the Oscorp building. Part of the charm of Spider-Man is that he was just a regular kid who was given amazing powers from a random spider bite. This film takes away the randomness and turns Peter Parker into a Chosen One sort of character. We always thought that anyone could have become Spider-Man if they had been in the right place at the right time. But no, only Peter could have been Spider-Man. That's ridiculous, but not nearly as ridiculous as the villains in this film. 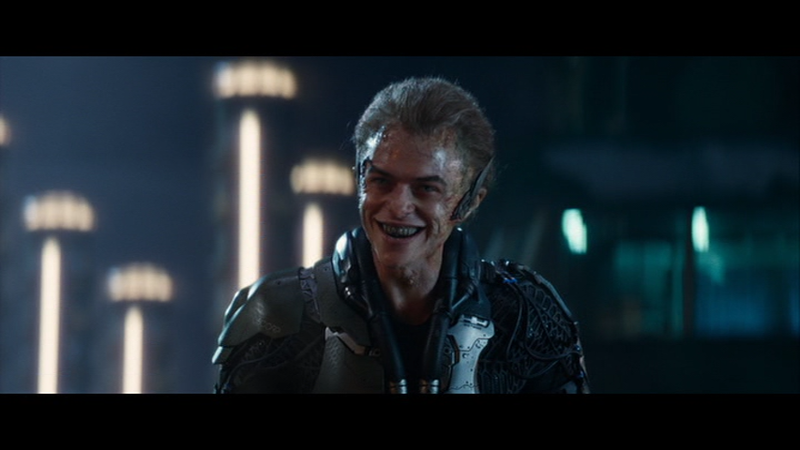 We meet Norman Osborn on his death bed, just long enough to see that the retroviral hyperplasia has started to make him take on a goblin-like appearance - because Norman Osborn was the Green Goblin in the comic books (and in Sam Raimi's first Spider-Man movie). His hands have been deformed the most, they look like monster mitts, which was already enough to make me ask "What were they thinking?" But there's much worse to come. 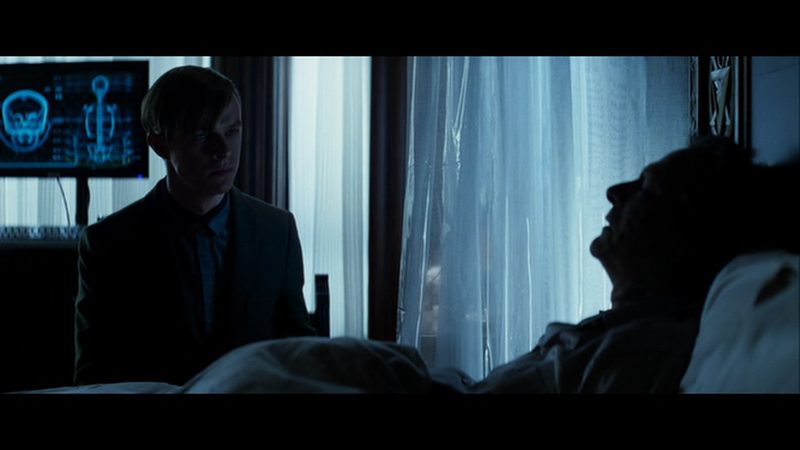 Before his death, Norman is visited by his young son Harry (Dane DeHaan), who he shipped off to boarding school years before. 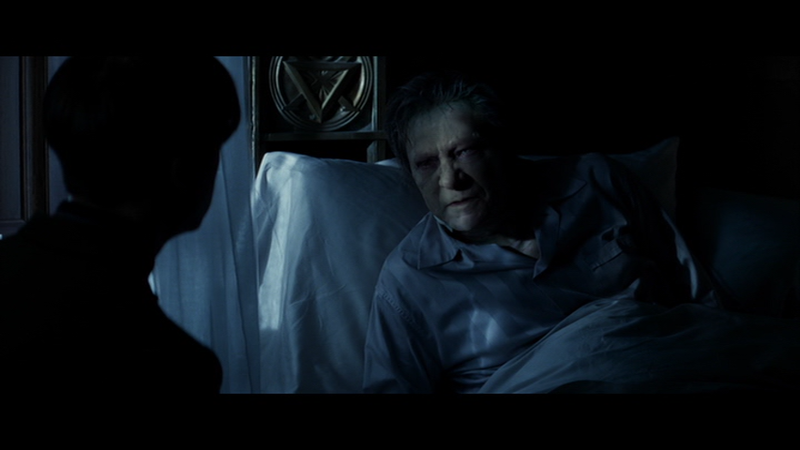 With his last breaths, Norman informs Harry that the disease is hereditary. Harry is already starting to exhibit minor symptoms of the disease, which Norman was diagnosed with when he was Harry's age. But while it took Norman decades to succumb to the illness, Harry has a highly accelerated decline, because the filmmakers have decided that they need to rush through his own Green Goblin origin so they can get Harry in the Goblin costume and flying around on a glider by the end of the film. An important part of Harry's villainous turn is the fact that he and Peter are childhood friends; when Spider-Man and Harry Green Goblin go to battle, these are close friends fighting. The Amazing Spider-Man 2 establishes that Harry and Peter were friends when they were kids, but it only devotes a couple scenes to this friendship because the movie is desperately trying to cram all of the necessary plot points into its 142 minute running time instead of letting things build up over a couple movies. 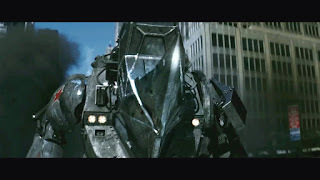 The filmmakers didn't need to get to the Green Goblin in this movie, especially since we had already gotten Norman's Green Goblin in Raimi's Spider-Man and then, after plenty of build-up, Harry's Green Goblin in Raimi's Spider-Man 3. Why do the Goblin again so soon? 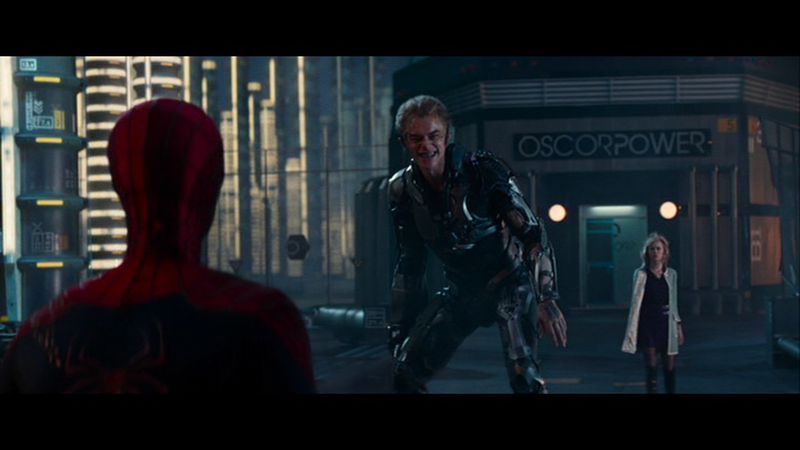 Green Goblin only joins the action for the climax, having been convinced that he needs Spider-Man's blood to cure himself. When he shows up, he brings about one of the most famous and tragic moments in Spider-Man comic history, but since he's not there until the end the movie had to pick a different villain from Spider-Man's rogues gallery to be the bad guy up to that point. They went with a villain that hadn't been done before, one that I had been wanting to see since the Raimi days. A classic one: Electro, who made his first appearance in The Amazing Spider-Man issue #9 back in 1964. But this is not a version of Electro that had ever been seen before, and the decisions made regarding this character were some of the most bafflingly bugnuts choices imaginable. Played by Jamie Foxx, Max Dillon is a mousy, put-upon maintenance man at the Oscorp building who drew up some designs for the electromagnetic power grids that are part of Oscorp's endeavor to turn old power stations into hydroelectric towers. Those designs are being used, but Max isn't receiving credit for them. 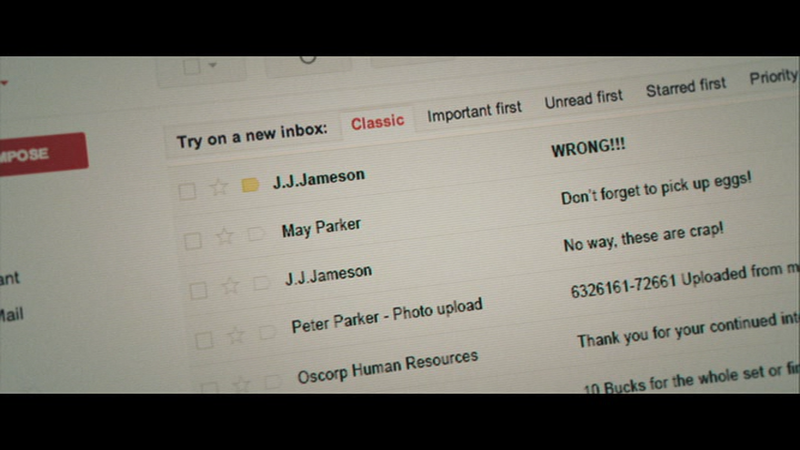 That's alright, he won't cause Oscorp any trouble. 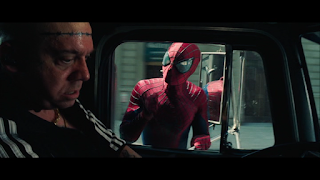 Max is such a lonely sad sack that when Spider-Man saves his life during a chase sequence, Max takes on a stalkery obsession with the friendly neighborhood webslinger. He imagines that they're best friends and carries on conversations with his invisible pal. 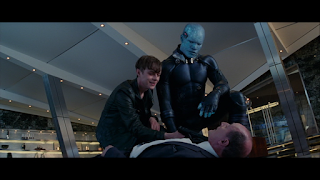 While doing some work at Oscorp, Max accidentally takes a tumble into a vat of genetically modified electric eels, who proceed to shock him to death. Or so it appears. Max's charred corpse is taken the morgue, but once there he rises from the dead and peels off that crispy outer layer to reveal that he now has glowing blue skin underneath and has gained the ability to manipulate electricity. He can even turn himself into electric current and travel through power lines. Dealing with his new Electro powers draws a lot of attention to Max, who gets off on actually getting attention for once in his life. Unfortunately, he is now extremely dangerous, so Spider-Man has to show up on the scene to try to get Electro under control... and Max doesn't take it well when his "best buddy" appears to have turned against him. Max is so insane, and the film's presentation of him is so insane, that his fractured thoughts are even incorporated into the score, his craziness turned into a song. 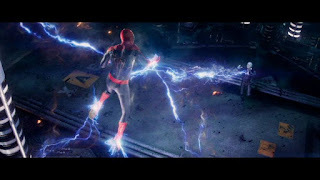 When I heard Electro's thoughts put to music, distorted voices in the score saying things like "Fragility / Electricity / That Spider-Man, he is my enemy", I couldn't believe it. My mind was blown. I wasn't liking the movie up to that point, but that was the moment when it completely went off the deep end. 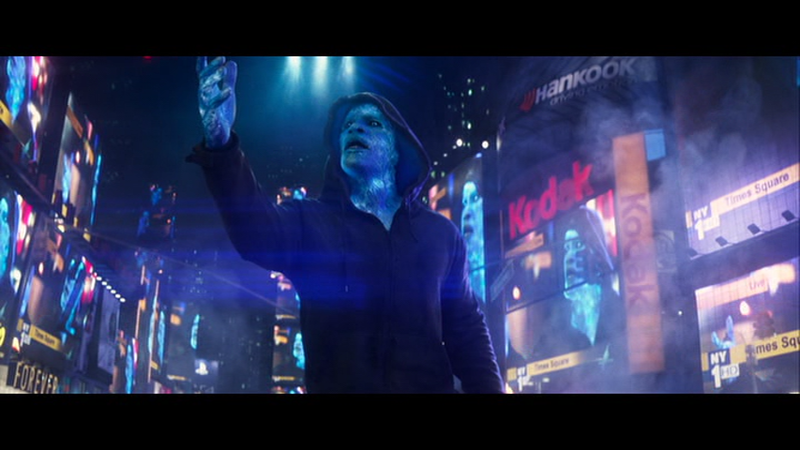 The Amazing Spider-Man 2 is full of absurd and bad decisions, and it's trying to do way too much at once. The story is over-stuffed, and in the middle of it Sony was also trying to build a bigger universe. Having seen the success Marvel Studios was having with their Marvel Cinematic Universe, the studio decided that they wanted to create their own comic book movie universe using the Marvel characters they had the rights to use: the characters of the Spider-Man comics. So Amazing 2 is packed with Easter eggs to set up future installments in the Spideyverse. 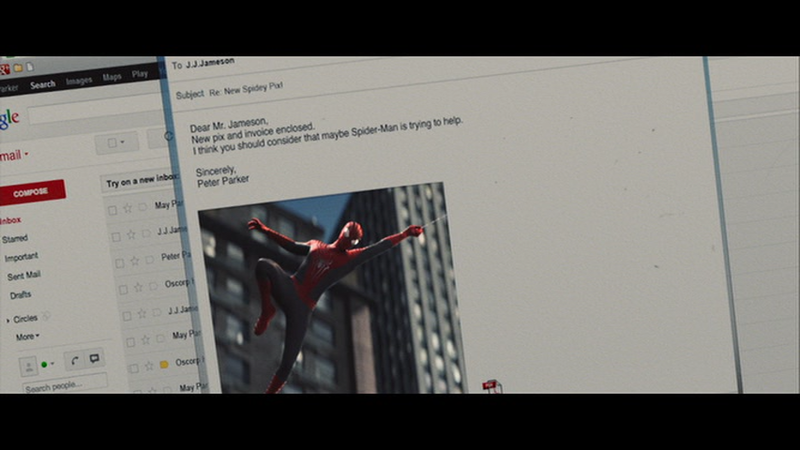 Computer files nod to Spider-Man villains Venom and Morbius; BJ Novak plays Oscorp employee Alistair Smythe, another villain from the comics; Peter exchanges e-mails with J. Jonah Jameson; clues point to the formation of a Sinister Six supervillain team; Harry's assistant (played by Felicity Jones) is named Felicia, indicating that she could be Felicia Hardy, the Black Cat. The filmmakers were just throwing in names by the time they started calling the assistant Felicia. That's up there with randomly naming Bryce Dallas Howard's character Gwen Stacy in Spider-Man 3. They even tried to establish Peter's future girlfriend Mary Jane Watson in this movie, shooting scenes with Shailene Woodley, one of my favorite modern actresses, in the role of MJ. Then they realized that they were trying to do too much and dropped the Mary Jane moments. Sony wanted to build their Spider-Man universe very quickly, too. Venom was set to get his own solo film and The Sinister Six were going to get their own movie before all of the villains had even been introduced in the Spider-Man movies. 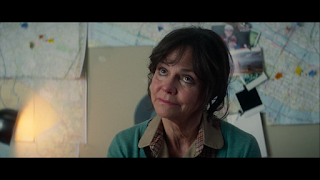 The plans got even nuttier: there was a rumor that Sony might make a movie centered on Peter's aunt May (Sally Field) and her days working as a secret agent (?!). 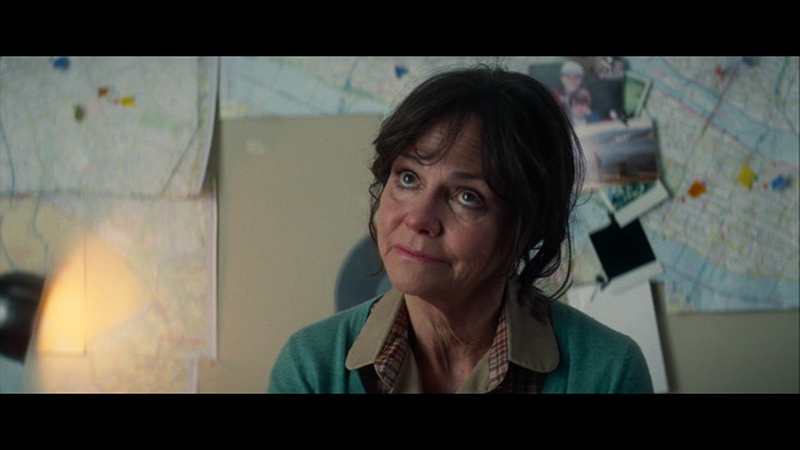 All of those plans fell apart when The Amazing Spider-Man 2 was met with largely negative, incredulous reactions. Word of mouth about this movie was so bad that I didn't even see it in the theatre, making it the only Spider-Man movie I didn't see on the big screen. I had planned to skip The Amazing Spider-Man, since I didn't want to watch the origin all over again, but circumstances had led me to seeing it despite my lack of enthusiasm. That didn't happen again with the sequel. I didn't watch this one until it was on DVD, and I didn't have anyone but my dog Zeppelin with me when I watched it. In case it was as bad as I had heard it was, I didn't want to inflict it on anyone else. Maybe it's not quite as bad as it has been made out to be, but it certainly isn't good. When I heard that this iteration of Spider-Man was being scrapped so a new version could officially join the Marvel Cinematic Universe (that version of Spider-Man, played by Tom Holland, made his debut in Captain America: Civil War), I was very relieved. This was not a universe I wanted to spend any more time in. 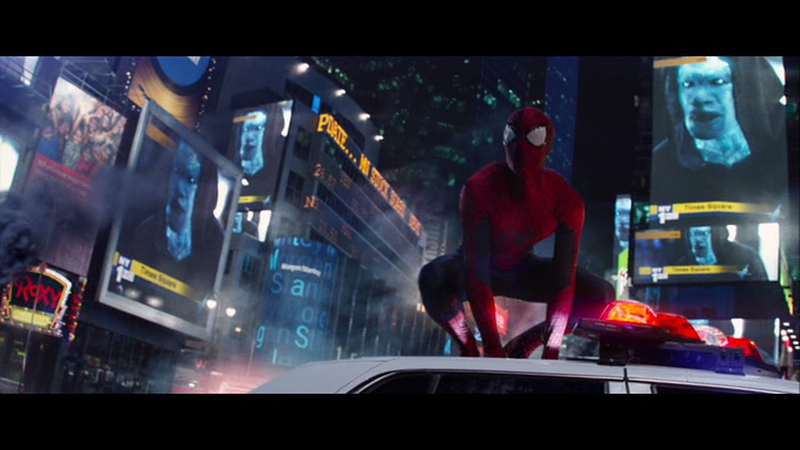 The villain side of The Amazing Spider-Man 2 is a total disaster, but they did do something right. They included the Rhino as a minor character, and cast Paul Giamatti as the armored rhino suit wearing baddie. During a 2011 appearance on Conan O'Brien's talk show, Giamatti had seriously/jokingly stated that the Rhino was a dream role for him, so it had to happen. Amazing 2 made that dream come true for Giamatti, and that alone makes its entire existence worthwhile.